The Students are 10 points from safety with seven games to play, while Moseley are three points better off as both clubs sit in the drop zone. With just two months left in the season, Loughborough and Moseley will be keen to secure the win at Billesley Common to enhance their survival chances. Esher are the other team who currently occupy a spot in the bottom three and the Surrey-based outfit travel to Darlington Mowden Park this weekend. At the right end of the division, the title race continues to heat up. Last weekend, Ampthill and District moved level on points with leaders Old Elthamians and the A’s go to Rotherham Titans on Saturday while OEs host Plymouth Albion before the top two collide in Round 25. Fellow promotion candidates Rosslyn Park entertain Chinnor this weekend and Blackheath visit Sale FC while elsewhere, Cinderford entertain Caldy and Cambridge face Bishop’s Stortford. Seven games to go and Old Elthamians are top of the pile. Since promotion in 2017, Gavin Lach’s side have continued their remarkable rise in the National Leagues and their latest chapter could be the best yet. With OEs not being in action last weekend, their lead at the summit was cut, but their fate is still in their own hands. ???? TEAM NEWS ? ?|@ElthamiansRFC make two changes to their starting line-up for tomorrow's clash with @AlbionRFC (ko 2pm), ahead of what DoR Gavin Lach describes as the most important seven days in the club's history. Ampthill and District’s victory over Caldy means the second-placed side have moved level on points with OEs so the league leaders will look to make a statement by claiming their seventh victory in a row on Saturday. In Round 24, they host Plymouth Albion who last time out returned to winning ways. An excellent triumph over Rotherham Titans means Kieran Hallett’s side have won four of their last five matches which leaves them midtable, as things stand. Albion have the capabilities to cause OEs problems and with confidence high, Plymouth could disrupt the title race this weekend. Things couldn’t have gone much better for Ampthill and District last week. With all the talk surrounding their game in hand, the A’s delivered a dominant 80-minute performance as they brushed Caldy aside. Their emphatic bonus-point win moved them level with league leaders Old Elthamians and it was certainly a sign of intent by Mark Lavery and Paul Turner’s side. Ampthill have won their last six games whilst their hosts on the weekend have really struggled for form over the last two months. Since the beginning of 2019, Rotherham Titans have won just two matches and any hopes of an immediate return to the Championship are now all but over. A long list of injuries hasn’t helped, but they showed good attacking intent in defeat against Chinnor last weekend. Joe Barker will be encouraged by his side’s display and he will be hoping they can produce a positive performance at Clifton Lane in Round 24 as they aim for a strong end to the campaign. In Rosslyn Park’s newsletter, they have outlined the remaining seven fixtures for the top four sides in National One. Last week, they took advantage of their game in hand as a sensational first half display against Birmingham Moseley has kept them in the title race, so the club have every right to be analysing the ‘run-in’ for their fellow promotion contenders. Park have won their last four matches and now sit four points behind the leading pair of Old Elthamians and Ampthill heading into this weekend. However, Kieran Power’s side will be in for a tough test in Round 24 when they welcome Chinnor to the capital. The Oxfordshire club will arrive at the Rock in high spirits after halting a four-match losing streak against Rotherham last week. The cutting edge and spark returned for Chinnor and they will have to show their qualities once again to come out on top against Rosslyn Park. It is probably fair to say Blackheath suffered a dose of the holiday blues. ‘Club’ picked up just one win from their first five games after Christmas, but in February, they kept themselves firmly in the promotion picture. Successive wins over Birmingham Moseley and Caldy mean James Shanahan’s side sit in fourth place and are eight points off the top, but they will know they can’t really afford another dip in form. The men from Well Hall have shown they are capable of stringing together a positive sequence of results and they will be hoping they can add to their current run when they take on Sale FC this weekend. The hosts enter March with momentum behind them and it couldn’t have come at a better time for Jonathan Keep’s men. After sitting preciously above the drop zone, Sale have won five of their last eight games to move 13 points clear of trouble with seven fixtures remaining. The Manchester-based club have also secured four straight victories at home and another triumph on their own turf would maintain the feel-good factor around the CorpAcq stadium. Darlington Mowden Park may have been disappointed after their 32-27 loss to Sale FC last week. Prior to that fixture, Danny Brown’s side had lost just one game since the start of 2019, but they were second best in Manchester as DMP suffered a narrow defeat. On the plus side, DMP rallied to claim two losing bonus-points and they will be keen to bounce back when they entertain Esher in Round 24. Victory for Darlington could lift them into fifth place while a win for Esher may well be necessary if they are to avoid relegation this term. The Surrey-based side sit eight points shy of safety as we begin the penultimate month of the season after losing five of their last six games. However, Ricky Nebbett’s men produced a very encouraging performance against league leaders Old Elthamians last time out and a similar display could see them clinch their first away victory for just over two months. Cinderford have certainly experienced the positives and negatives in 2019 thus far. Three straight victories in January have been followed by successive defeats against Plymouth, Ampthill & District and Cambridge so it is easy to understand why the Foresters sit ninth in the table as we enter March this weekend. In truth, Paul Morris and his side may be satisfied with their position after promotion back into National One last year, but they will be eager to arrest this mini-blip in form. The Gloucestershire outfit have an opportunity to achieve just that when they host Caldy this weekend, who arrive at Dockham Road on the back of a thumping by Ampthill. The Wirral outfit have shipped 105 points in their last two games, but granted, they have been against two of the title contenders. Caldy sit six points above the drop zone as things stand, but just their second victory from their last nine games would maintain a cushion between themselves and the trapdoor. Following their 10-6 win over Cinderford two weeks ago, Cambridge head coach Richie Williams told Cambridge News the result was more important than the performance. The Blood and Sand grinded out the win at Volac Park and two victories from their last three matches has moved them nine points clear of the relegation places. Williams also mentioned how key it was to continuously pick up points and they will have their sights set on claiming a positive result against Bishop’s Stortford this weekend. Similarly to Cambridge, the home side’s recent resurgence has created distance between themselves and the drop zone. A superb run of five straight victories has lifted Andy Long’s side away from danger and they sit nine points above the bottom three. Their winning streak did come to a halt last time out against title-chasing Ampthill so Stortford will be looking for a reaction at the first time of asking in Round 24. With two months to go in the season, Birmingham Moseley’s meeting with Loughborough Students could be a pivotal one as both sides look to avoid relegation from National One. As things stand, Moseley are six points from safety after they battled back to secure a bonus-point in their game in hand against Rosslyn Park last week. Richard Protherough’s side have a crucial run-in to the season with the likes of Caldy, Cambridge and Esher still to come, but victory over Loughborough would certainly be a big step in the right direction. For Students, this is arguably a must win game as Alan Buzza’s men sit bottom of the division and 10 points from safety. 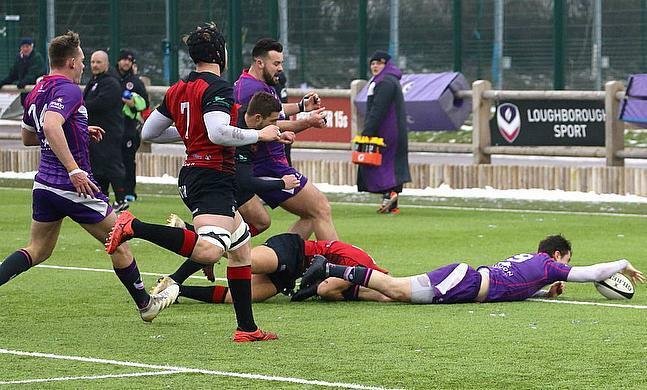 One win from their last six matches has kept them in the drop zone, but if Loughborough were to secure their second away triumph in Round 24, it could be the spark they need to relaunch a revival.